I curate annotated lists of book series and journals relating to medieval and early modern studies, bibliography, book history, textual studies, and literary history. Entries include a description of the journal or series, as well as information about the publisher, editor(s), and submission process. If you spot any errors or have additions to suggest, let me know. Claire Bourne maintains an up-to-date, comprehensive list of digital resources for the study of Early Modern Plays on Stage & Page on her website, ¶Of Pilcrows. Sarah Werner also maintains a list of digital collections of early printed books with open-access reuse policies on her website, Wynken de Worde. M. L. Stapleton has produced an invaluable resource devoted to historic editions of Shakespeare, with links to facsimile scans where available. Be sure to check out the "More" tab! Tara Lyons and her students at Illinois State University have launched Shakespeare in Sheets, making Shakespeare's books available in ready-to-fold signature sheets (PDF). 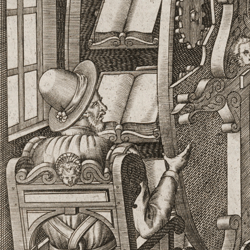 Coming soon – my handouts on reading early modern manuscript and print. Handy hints for digitally manipulating early modern woodcuts for fun and profit (see DRE Zazzle Store) or creatively reproducing them as fun linocuts. Coming soon!